Order, pay, and earn Stars. The Starbucks® app is a convenient way to pay in store or skip the line and order ahead. Rewards are built right in, so you’ll collect Stars and start earning free drinks and food with every purchase. Save time and earn Rewards when you pay with the Starbucks® app at many stores in the U.S.
Customize and place your order, and pick up from a nearby store without waiting in line. Track your Stars and redeem Rewards for a free food or drink of your choosing. Receive custom offers as a Starbucks Rewards™ member. 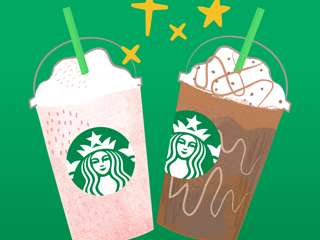 Say thanks with a digital Starbucks Card. It’s easy to redeem a gift from email or in the Starbucks® app. Check your Starbucks Card balance, add money, view past purchases and transfer balances between cards. See stores near you, get directions, hours and view store amenities before you make the trip. Discover what songs are playing at your local store. Leave a tip on purchases made with the app at many stores in the U.S.
New Rewards, new choices — see what’s new and how to use Stars toward your favorite things. We’ve had Starbucks’ super-handy app on our phones for ages, and it’s staying right there. The streamlined dashboard gives us quick access to features like rewards and gift cards. Plus, we can place an order at any of more than 7,700 company-owned stores nationwide and pay ahead of time—and when we arrive, it’s all ready to pick up. I've used the app for about 3 years and seen it get better and better. Just about everything I've left as feedback for the app has been added to or fixed in the app after the last major refresh. Not that they were listening to me in particular, but it shows that they are trying to make this app a truly useful piece of software. TouchID makes account refills a 15 second affair, favorites make re-ordering sooo much faster, and finally all notifications and promos are in the app, so you don't have to check the website also. The store location maps are now much more accurate. The only disappointment for me is the apps inability to accurately register the quantity of items you've purchased for StarDash promos. Unless you complete a SEPARATE transaction for every item individually in your order, it will not correctly track the number of purchases. 8 of 10 StarDash promos I complete require a phone call to Starbucks customer service to ensure I get all the stars I'm due. They are always cordial, and always fix the issue, but 8 out of 10 times? Really? I won't deduct stars because to be honest, the same thing happens whether you use the app or pay cash at the register. I hear they've fixed this problem with an update, so I will test this update to see if it really and if it works consistently, I'll edit this review. I continue to run into the issue of the balance not being updated on the app although at the store when I go to pay they say I don't have enough money on the app!!! The stars also take a long time to be reflected in the app sometimes over 24 hours and this is true to the challenges as well. I did a challenge 2 days in a row and waited for the first day to populate, the next day I had the exact order and still didn't have the challenge updated and when I mentioned it to the manager at the time she literally shrugged and said - well I don't know anything about that! It also seems to be an issue when I order in person and tell them I need to load the app and then they entered the order to the register then they can't load mid transaction and that if they delete the order they don't know when the partial payment would be put back on my app and then they ask for cash! I tell them I started off telling them I needed to reload and have the app and credit card out together! Still a disconnection from the app and the stores!!! I would also like to see my actual listed so if any reason I don't get the correct stars or challenge it can be mitigated. I feel like I have done my side purchasing the items for challenge but then getting ripped off by not getting any of those stars and then since I didn't take a receipt I have no proof that is what I actually purchased and stars should be awarded for the challenges!! I'm out 200 stars in just the past 2 days!! !